The Standard Triumph sports car. The Standard Motor Company was set up in Coventry in 1903 and, initially, concentrated on six cylinder saloons. During WW1, the company manufactured in excess of 1,000 aircraft, including the renowned Sopwith Pup and Bristol F2-B. By 1924, the company had grown in size to such an extent that it had a market share comparable with the Austin Motor Company. At this point, it was manufacturing over 10,000 saloon cars a year. Around 1929, the company was supplying chassis to specialist coachbuilders such as Jensen and Avon, which itself was later to commence production of cars that could basically be described as a "sporty" car. Later, a Standard engine and chassis was used in what would become the legendary SS Jaguar. 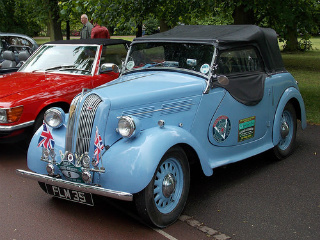 In 1939, Standard acquired the Triumph Motor Company which had just gone into receivership. Triumph was restructured as a subsidiary of Standard. In 1948, Standard adopted a policy of producing just one model with the launch of the 2 litre Standard Vanguard. This policy was kept in place until 1953 when the Standard Eight, a new small saloon car, was introduced. In 1952, there was, indeed, a surprise in store at the London Motor Show. This took the form of a two seater which incorporated a modified Standard Eight chassis and a Vanguard engine. However, owing to a distinct lack of luggage space, production was held back until 1953 to allow time for the rear of the car to be restyled in order to incorporate a boot of sufficient capacity. The car was to be marketed under the name Triumph, instead of Standard, since the latter would be associated with saloon cars. As a result of this re-branding, the Triumph TR2 was born. Furthermore, in order to generate appropriate publicity, a slightly modified version of the basic TR2 achieved a maximum speed of 124 mph on a suitable highway in Belgium. 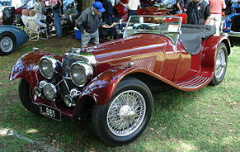 A resultant spin-off from this promotional activity was that small manufacturers, such as Morgan, would approach the Standard Motor Company for engines, chassis, and so on. In 1961, the Standard Atlas Major van was introduced, powered by the Standard 1670 cc engine utilising wet liners. Consequently, this engine was to be used as the basis for that incorporated in the classic cars TR2, TR3 and TR4. In 1968, as a result of a takeover by Leyland Motors, all production at Standard ended in the UK, by which time a 2138 cc engine was in widespread use, and available for the TR range. Hence a legend was created, spanning the somewhat basic TR2 through to the technically advanced TR5 and TR6. The beauty of the series was that it catered for customers who required a car with different levels of sophistication, and yet still provided the excitement and romance of top-down motoring.